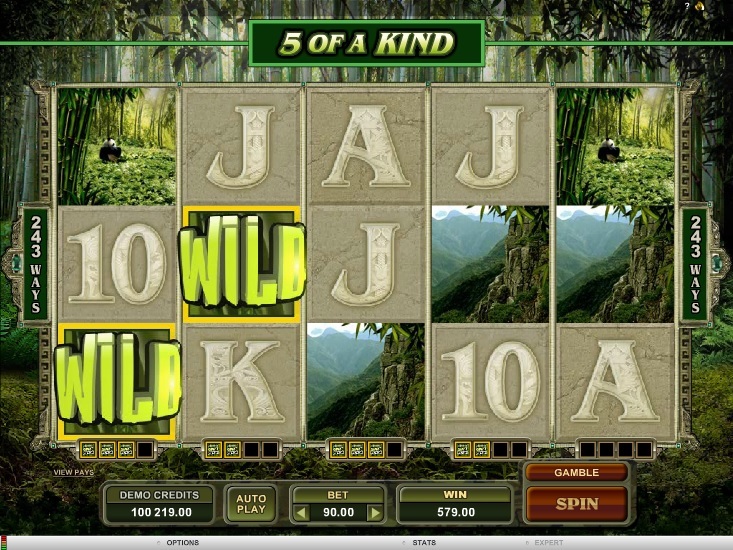 Untamed Giant Panda is one of the slots in Microgaming’s Untamed series of slots. The slot comes with many innovative & rewarding features that give players a chance to win plenty of coins. Playing the Untamed Giant Panda is easy because of its 243 ways to win. Since the paylines are permanently activated, players have to bet in increments of $0.30 up to $22.50. To play the slot, players should place a bet, hit the spin button, and create winning combinations. Untamed Giant Panda is one of the most beautiful slots in the Microgaming portfolio, giving players a lucrative opportunity to study the panda and its beautiful habitat. The reels feature symbols of the Giant Panda, bamboo forests, mountain ranges, and the baby panda. There are also a few high-value playing cards scattered along the reels. Needless to say, the slot features fabulous graphics, audio effects, ambience music, and animation, capable of taking players deep into the bamboo forests, where they can meet the cuddly giant panda. The Untamed Giant Panda symbol serves as the wild, substituting for other symbols and helping players complete winning combinations. However, players cannot use the wild symbol to unlock the free spins round as it cannot substitute for the scatter symbol. Whenever players land an Untamed Giant Panda wild symbol on the reels, it gets collected at the bottom of the reels. If players collect four such symbols, the entire reel will be transformed into a wild. Players can convert up to five reels into wilds, leading to incredibly huge rewards. The Eye of the Panda symbol is the scatter, and players need to get at least three anywhere on the reels to win scatter payouts. If players land 3, 4, or 5 scatter symbols along an active payline, they will win 112.50 coins, 562.50 coins, or 5625.00 coins, respectively. If players land at least three scatter symbols on the reels, the free spins bonus round gets activated and players will receive 10 free spins with brilliant wilds. If the Untamed Giant Panda wild symbol appears during the free spins, it remains frozen in position till the end of the round. Untamed Giant Panda comes with another special feature called Lucky Nudge, during which scatter symbols may peep from above or below the reels. If this happens, these symbols may be nudged onto the reels to unlock the free spins bonus round for players. The slot also comes with an optional gamble feature, which allows players to double either part of their winnings or all of it. Untamed Giant Panda is one of the most popular slots in the Microgaming portfolio because it is packed with lucrative features such as 243 ways to win, lucky nudge feature, free spins, collectable wilds, and brilliant wilds.